Fans got an extended look at Disney’s Aladdin as it found its way into the broadcast of tonight’s 61st Grammy Awards. 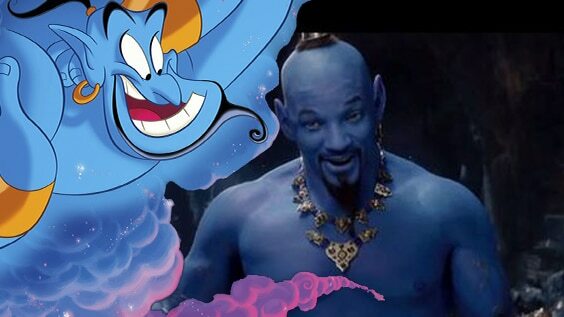 We also got our first look at Will Smith’s Genie, confirming that he will look a lot like the animated version. A still released last year showed Smith in his genie form but lacking his blue skin. Despite the initial cold reception from fans, Aladdin producer Dan Lin insisted Smith’s take on the Genie would be blue in the film. The new Aladdin film is directed by Guy Ritchie. The script has been written by Vanessa Taylor and John August. Aladdin stars Naomi Scott, Mena Massoud, Billy Magnussen, Will Smith, Nasim Pedrad, Marwan Kenzari and Navid Negahban. Aladdin will hit the theaters on May 24.